30 Easy Nail Art Designs e-book featuring 30 nail art tutorials is your guide to creating flawless nail art at home, easy and quick! Want to learn how to do manicures for special occasions at home? Want to learn how to do flawless nail art yourself but don’t know how? Wouldn’t be great if you knew you how to do all the amazing nail art you see on your favorite blogs and Pinterest? Filled with unique nail art and detailed tutorials, the 30 Easy Nail Art Designs e-book is the perfect guide to DIY nail art for every beauty lover. Packed with editorial quality images, easy step-by-step instructions, nail art tips it will guide you through the flawless execution of all the projects. Plus, you’ll be equipped with the skills to try you hand at virtually any design you can imagine. You’ll never wear plain nails again! The book is written to accommodate any level of experience. If you’re just starting out, this book is all you need to learn how to do flawless nail art yourself. If you’re a professional manicurist, you can use this book as a source of nailspiration and a guide to modern nail art techniques. All the featured nail tutorials can be done without special equipment and most take less than 15 minutes to do. Designs for different occasions: day, night, work, date, Valentine’s Day – you name it! Can I preview the book? Here’s a few pages as a sampler. All pages are A4 filled with high resolution photography. This book is everyone who wants their nails to look fabulous and wants to learn how to do nail art themselves! Its for any age and level of expertise. Not at all! 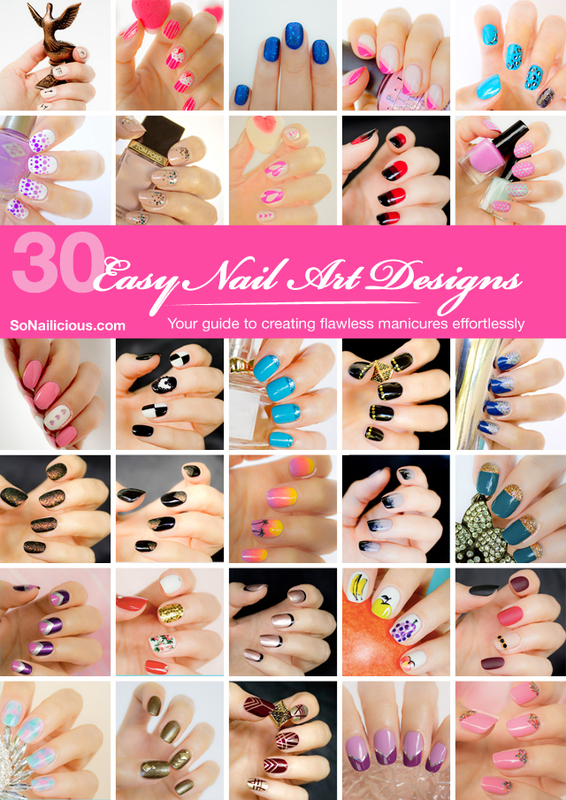 30 Easy Nail Art Designs is a PDF e-book which can be read on any device with the free Adobe PDF Reader. You can print it out, keep it on your home computer/laptop or sync it to your iPad, iPhone or e-reader. Note: the book looks better in full colour, as colours are crucial to some of the manicures. Payment is handled securely via PayPal – you don’t need an account to purchase. You can pay via PayPal or Credit Card and download immediately your copy of the book. You will also receive 2 emails from SoNailicious with your receipt and your download link for the e-book. Buy it today and save! 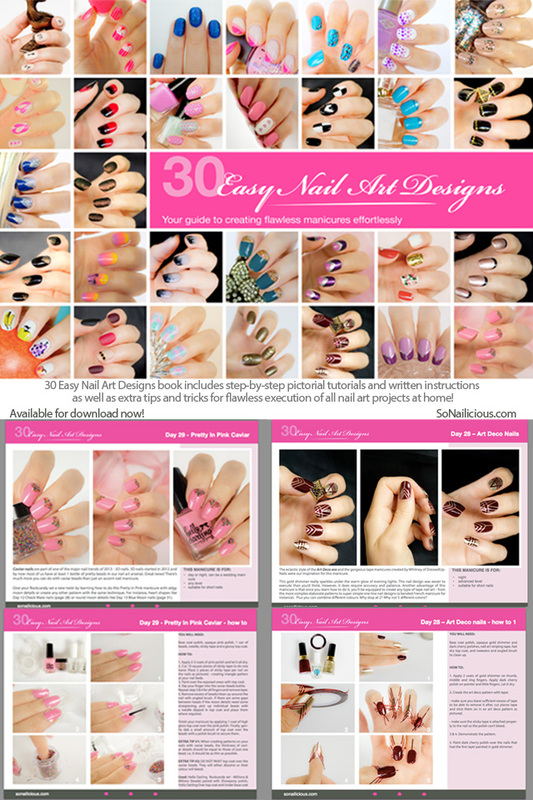 The 30 Easy Nail Art Designs & Nail Tutorials e-book is ready for you to download at just $14.50 USD today. If you are not satisfied with the 30 Easy Nail Art Designs PDF book after 60 days just let us know and we’ll refund your money, no questions asked – that’s how confident we’re that you’ll enjoy this book. If you have any questions, please email us directly at editor (@) sonailicious.com.